Researchers Believe Bone Tattoo Kit To Be World's Oldest Of Its Kind Australian researchers used carbon dating to determine the tattoo tools from Tonga are around 2,700 years old. 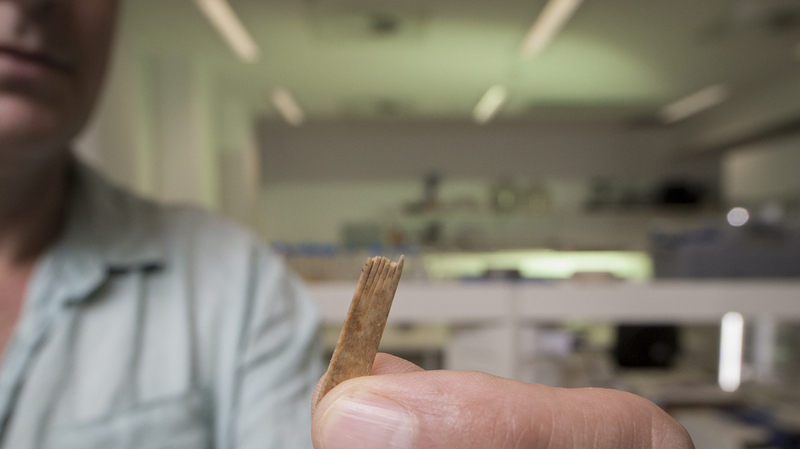 Geoffrey Clark of Australian National University holds a bone comb from a tattooing kit found to be approximately 2,700 years old. Radiocarbon dating reveals the implements to be around 2,700 years old, according to researchers in Australia, who say to their knowledge that makes them the oldest of their kind ever discovered. Michelle Langley of Griffith University and Geoffrey Clark of Australian National University conducted the research on the ancient instruments: two made of bird bone and two "probably" of human bone. The tools, called "bone combs," resembling hair combs with their grooved edges, were sharp enough to be used as blades that with the stroke of a mallet could drive pigment into the skin in the complex linear designs famous in Oceania. "This discovery pushes back the date of Polynesian tattooing right back to the beginnings of Polynesian cultures around 2,700 years ago," Clark said in a statement. Langley and Clark believe the method may have been innovated in and spread from West Polynesia, where Tonga is located. It has withstood millennia. "If people get traditional Pacific tattoos, it's exactly the same tool," Langley said. The practice took on added significance after 19th century Christian missionaries banned tattooing in parts of the Pacific, spurring people to travel to other islands to get the markings central to their beliefs and traditions. 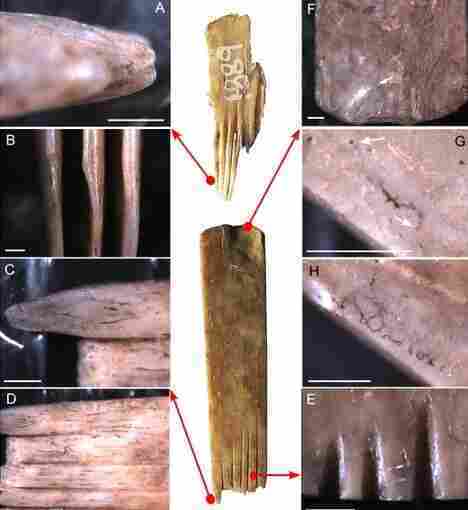 It is thought that the Tongan bone combs were part of a kit belonging to an ancient tattoo artist. One tool was broken, and the researchers said it looked like it was in the process of being repaired, "so perhaps the kit was accidentally left behind or was too broken to bother salvaging," they theorized. The bone combs were once thought to have been lost forever. Excavated on the island of Tongatapu in the 1960s, they were stored away for later study. But in 2003, a fire burned down the building that was housing the material from the excavation. Five years later, the bone combs were found intact in a different storage facility, allowing the researchers to study them. Despite the passage of thousands of years, residual ink can still be seen along the edges. An ink pot, also unearthed in the 1960s, has since gone missing, perhaps lost in the fire, which Langley and Clark said made the rare discovery the oldest complete tattooing kit found anywhere in the world. The researchers' full article, Ancient Tattooing in Polynesia, appears in The Journal of Island & Coastal Archaeology.